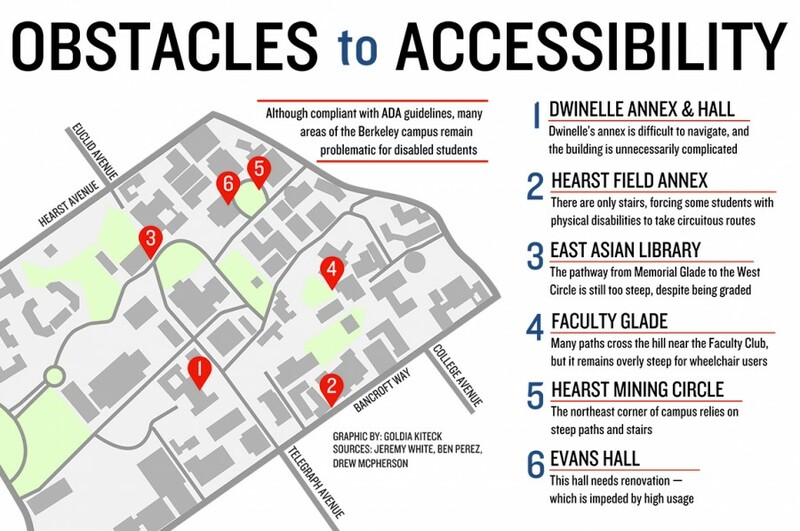 This is a map showing locations on campus that pose challenges to accessibility: Dwinelle Annex and Hall, Hearst Field Annex, East Asian Library, Faculty Glade, Hearst Mining Circle and Evans Hall. The campus has expanded accessibility in order to comply with the Americans with Disabilities Act and requirements imposed after lawsuits. Barriers for students with physical disabilities, however, can often lie less in building plans, which are picked over for potential inaccessibility, than in barriers of the moment.